This book aims to teach human anatomy at a more accessible level, so that it can be used in advanced undergraduate and medical levels. Each region begins with the bones, then the muscles from superficial to the deep layers, followed by the discussion of the nerves and vessels. The order of the teaching depends on the individual instructor. Anatomy is one of the main keystones in the basic foundation of medical science. The study of regional anatomy helps create that strong foundation. When anatomy is discussed, by systems, for instance, important relations between different structures within a region may not be discussed, since each region contains parts of different systems that are not taught at the same time. Learning all of the muscles of the body within 1-2 weeks, and memorizing their function or innervation without their application in the region, or their malfunctions, including signs and symptoms and clinical correlations, may make the subject less interesting. 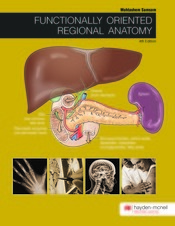 Moreover, since a regional approach is usually followed in the medical anatomy labs, a regional anatomy book can be very helpful in making the connections between the lecture and the lab, and therefore learning the anatomy more efficiently.